Littering has always been one of my pet-peeves. On a walk back from the beach one day, where we had cleaned up trash, my then 6yr old son raced back home as my 2 yr. old daughter and I lagged behind. My daughter spotted a beer bottle in our path, exclaimed “garbage” and darted to grab it. My mind instantly flooded with worry…what if she cuts herself? the germs? What would people think if they saw her holding a beer bottle!? Yet, my heart wondered how I could tell her “no”? 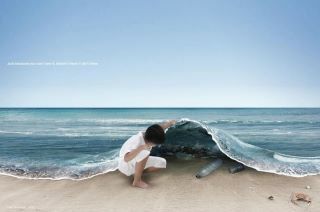 How confusing the message would be if it was OK to pick up trash at the beach but not here. Was it worth scolding to thwart a genuine gesture? She joyfully picked it before I could finish this internal debate. I thanked her and asked if I could hold it for her. She refused as she was determined to throw it in the bin herself. I took a deep breath and chose to let it be, yet struggled to stop worrying. I kept thinking about what if someone took a snapshot of this little girl holding a beer bottle. Would they call human services on me? How sad it would be that people could judge me without any context and awareness of the level of introspection that has gone into this moment. I felt angry at myself that instead of celebrating my daughter’s level of consciousness and sense of accomplishment, I was stuck in fear. I was reminded of this story when on another outing my kids spent 20 minutes cleaning up cigarette butts from our downtown area. My son was going off on how people could treat the earth like this. I started to worry again but couldn’t get them to stop cleaning so I finally joined in. We made a game out it and it felt good. There have been times where I did make some excuse about why we shouldn’t pick up litter and my son expresses, “It hurts my body to see the trash on the ground and have to leave it there.” I get teary-eyed just repeating that statement. Both my children truly understand that the world is not a garbage can and take responsibility to make it beautiful.